Barbara Alcock – Mainly painting in oils, I am inspired by different locations, merging glimpses in the real world with ideas from my imagination. Greece in particular remains a source of visual excitement from the labyrinthian narrow white-washed streets of Chora in Patmos to the dramatic volcanic ‘moonscape’ of western Lesvos. I worked for several years as Museum Photographer in Lewes and photography continues to play an important role in my practice. After studying Fine Art at Loughborough College of Art and Design I moved to Brighton and obtained a Post Graduate Printmaking Diploma from Brighton University. Group exhibitions include London, Italy, Sussex, Brighton Open Houses and Artwave. I am a member of Kemptown Arts Association in Brighton. 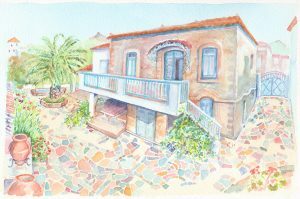 Posted in Lewes Artwave 2018 and tagged Artwave festival 2018, Homemade, House Portraits, Kemptown Arts, Lewes Artwave 2018, Water colour, Wendy Darby.